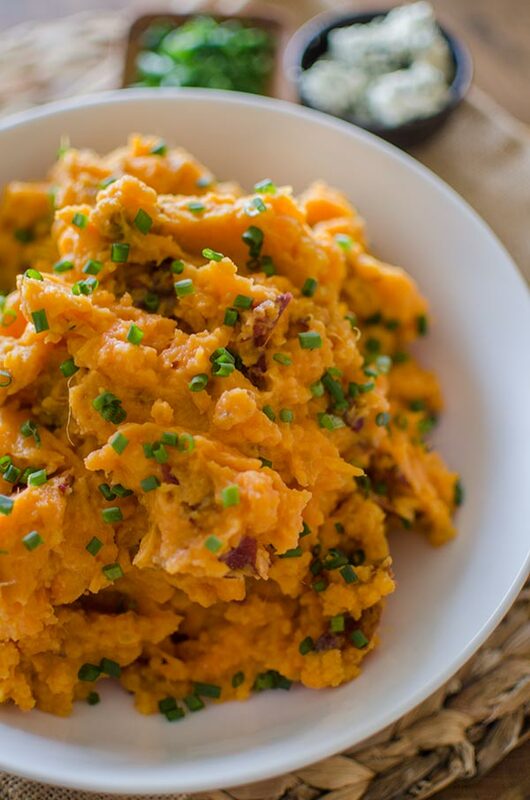 Buttermilk blue cheese mashed sweet potatoes are the perfect a rich and tangy side dish for your Thanksgiving menu. Last year I missed Thanksgiving. It was the first time that I wasn’t home for Thanksgiving. I was in Copenhagen visiting one of my oldest friends. I had a couple of weeks off between jobs, and decided to use this time for a little vacation to Copenhagen and Madrid. It definitely felt weird not to be home for Thanksgiving, but we still celebrated at a “Friendsgiving”. My friend made my sourdough stuffing, which was definitely a hit (she made it again this year!). I didn’t contribute anything, but if I could have, it would definitely have been these buttermilk blue cheesed mashed sweet potatoes. This is a recipe I created over a year ago. There are two reasons that I develop recipes; one is based on a craving and the other is based on a need. I’ve never been a fan of the too-sweet sweet potato casserole (I mean marshmallows and sweet potatoes? No thank you), or adding more maple syrup or brown sugar to sweet potatoes. I know there are many people who love this, but I’m more of a savoury than sweet kind of person. I wanted to create a Thanksgiving side dish for people like me so I turned to two ingredients that would add layers of flavour to balance the sweet nature of sweet potatoes. The first is buttermilk. Buttermilk adds a tang to the sweet potatoes and replaces all the regular milk you’d use in mashed potatoes. The first time I made these, I used half buttermilk and half 2% milk, but in my subsequent tests, I tried with 100% buttermilk and it worked even better. When I develop recipes, I always try to be really cognizant of the number of ingredients. So this was a happy realization. The rest of the flavour comes from blue cheese. 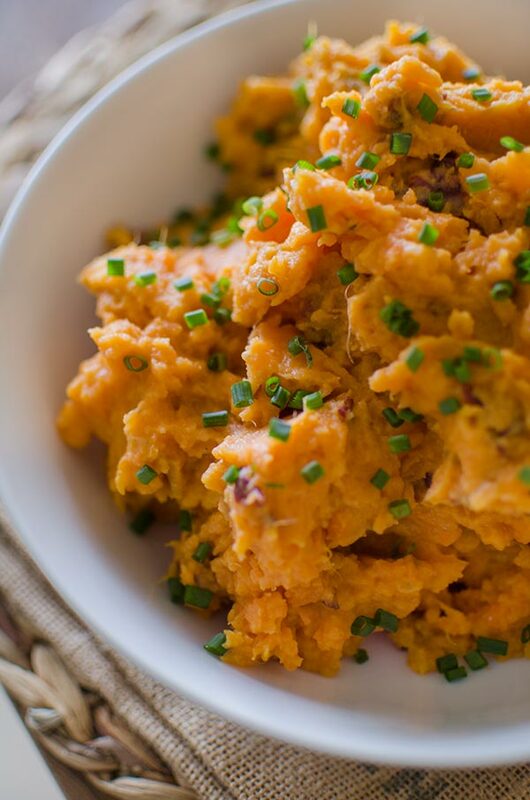 Now if you’re a fan of blue cheese, you will love these mashed sweet potatoes. And if you don’t like blue cheese? Well, maybe try something different like miso roasted sweet potatoes. I stir in the crumbled blue cheese after the potatoes have been mashed but while they are still warm, this allows the cheese to melt into the potatoes. Using this method, you don’t end up with clumps of blue cheese, but the entire dish has the flavour. I like my mashed sweet potatoes to be on the rustic side–you’ll notice that I keep the skins on. Just be sure to really scrub them well. I also use a regular potato masher to mash them–you could use a ricer if you have one for the perfect texture. Boil salted water in a large pot. Add sweet potatoes and cook for 15 minutes or until soft enough to mash. Drain and return to pot. Add salt, buttermilk and butter. Mash using a potato masher until desired texture. While still warm, stir in blue cheese. 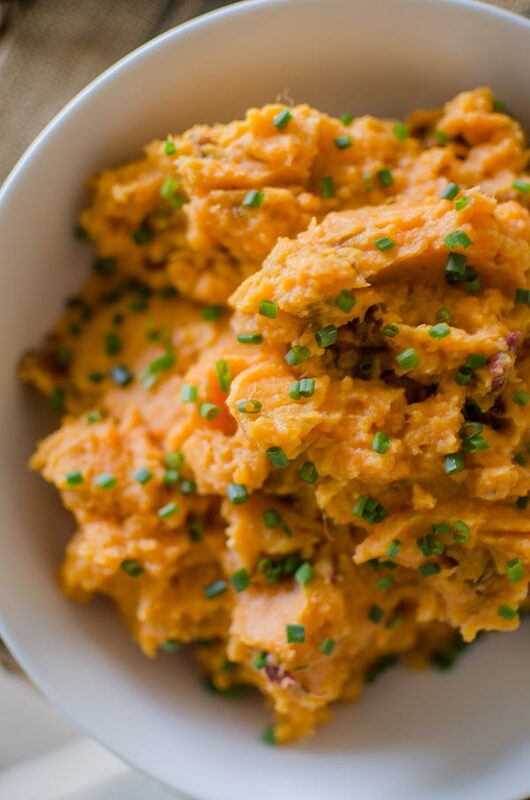 Let me know if you give these buttermilk blue cheese mashed sweet potatoes a try in the comments below.